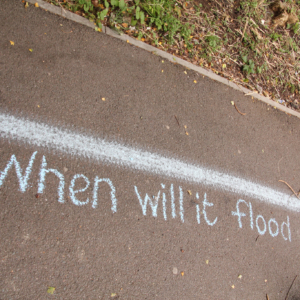 HighWaterLine – drawing a line on the cityscape to open up community dialogue on climate change and the impact of flooding. We wanted to put the power of creative thinking in the hands of community organisations and give people a chance to think positively in the face of climate change. The HighWaterLine project was initiated in New York City, USA, and has since been replicated in Miami, Philadelphia and Bristol (UK). Mosher invites people to reproduce the work anywhere. 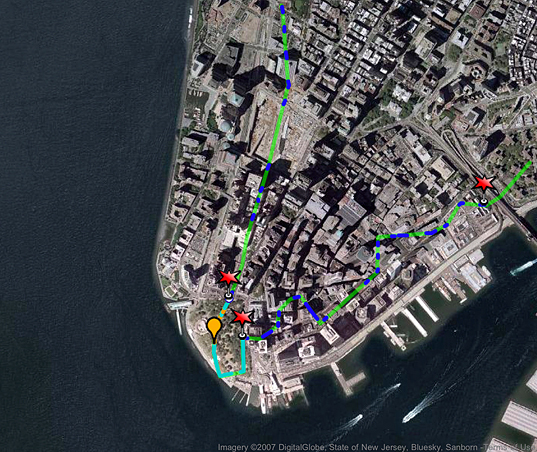 HighWaterLine visualised the anticipated impact of the “100 Year Flood” on New York City. The project was implemented in 2007, five years before the reality hit New York City in the form of Hurricane Sandy in 2012. 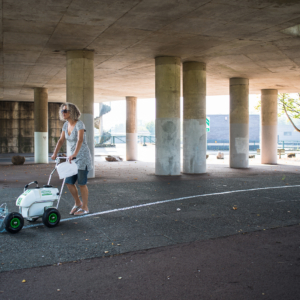 Using satellite images, maps, research conducted by NASA and interviews with NASA scientists, amongst other sources, artist Eve Mosher traced a line indicating the point of ten feet above sea level throughout the city. One of Mosher’s motivations was that climate change science is predicting that “100 Year Floods” are likely to become more frequent over the next 50 years. Mosher’s line traced 70 miles, around the 5 Boroughs of New York City, at ten feet above sea level. 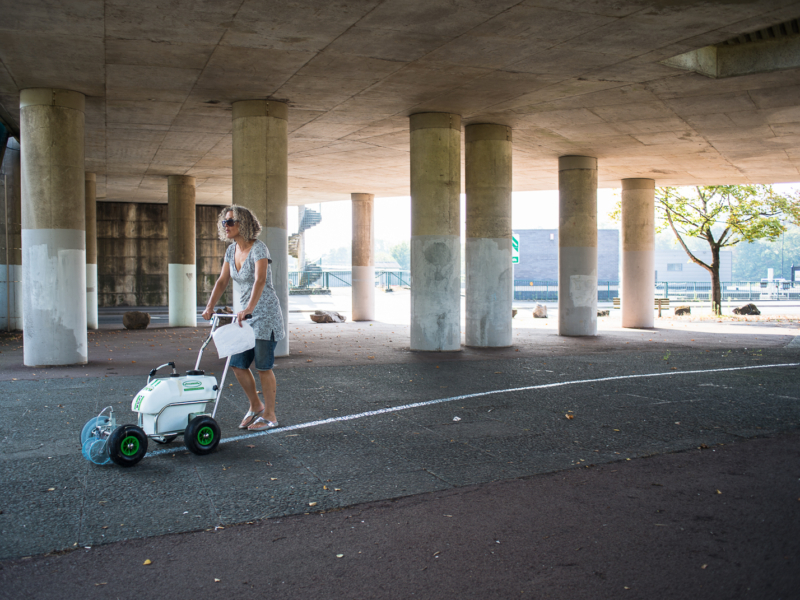 The artist utilised a “heavy hitter,” a machine used for drawing chalk lines onto football pitches, to mark the line. Illuminated beacons were placed in areas she could not draw across. 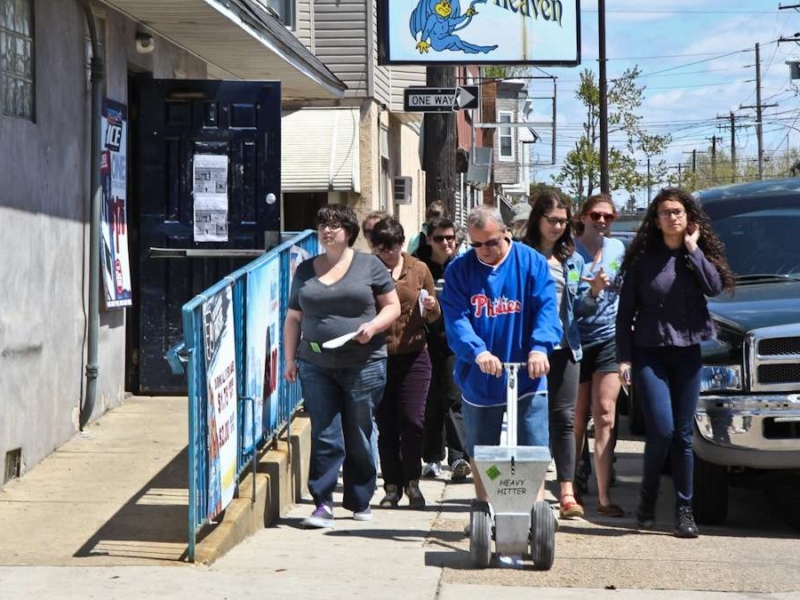 Through this process, Mosher could directly engage with communities, as the line passed through a multitude of residential and retail areas. Map showing the HighWaterLine New York City. 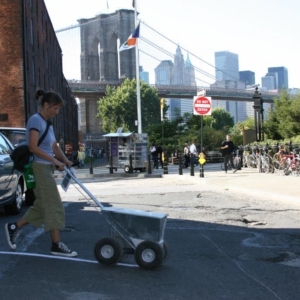 Through this public art method, the flooding issue was brought to the attention of residents, rather than the typical scenario where an audience approaches the art. 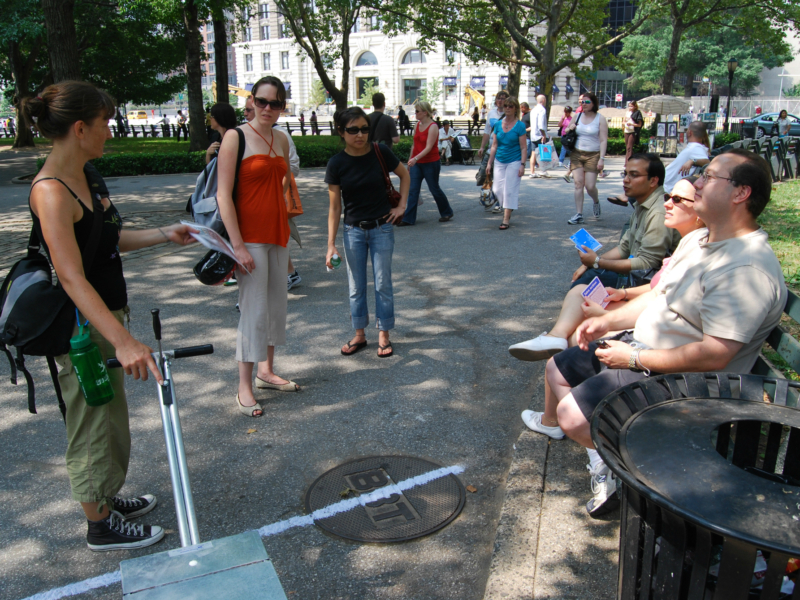 This curious practice invited passing people into conversation, allowing Mosher to explain her motives and providing a visual understanding of the consequences of climate change and encourage conversations on solutions. In 2014, HighWaterLine was implemented along the waterfront of Bristol and Avon Mouth. This adaptation of the project was instigated and managed by Isobell Tarr in partnership with Invisible Dust, an organisation that works with artists and scientists to create interdisciplinary works relating to environmental issues and climate change. The role of community engagement with the project further evolved in this manifestation; local residents were integral to the production and implementation of HighWaterLine | Bristol from its earliest stages. Mapping workshops were held to determine the path of the line and over 40 people participated in the chalking of the line. Other workshops were held to devise flood-prevention solutions and share knowledge. The participating community members used the publicly accessible flood risk assessment maps from the Environment Agency to delineate areas likely to flood along a 32-mile line, taking into account various predictive climate models and data. Researchers at Bristol University’s School of Geography provided assistance with the interpretation of this data. New community connections were created amongst those who lived within the most vulnerable areas adjacent to the line. By having community members involved from these early phases, community ownership and leadership from within became a prevalent aspect of the project. Significantly, a large portion of the community members involved in the implementation of the project were not from an arts background, but the project gave them an opportunity to contribute to a shared artistic vision. The establishment of a ‘core group’ of proactive community members has seen that the spirit of the project and its associated dialogue on adaptation and resilience continues in Bristol. 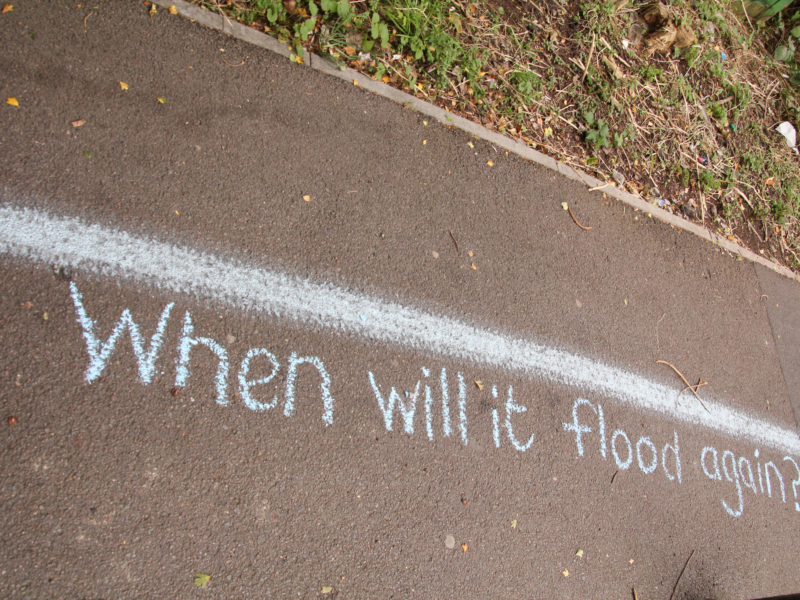 This project has been replicated in various other locations, and continues to encourage participants to draw their own flood line in different sites. 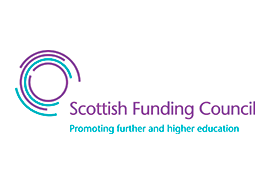 Participants are provided with an educational Action Guide and workshop to enable an understanding of the process and cause. As more people contribute to this project, the knowledge can be spread further. 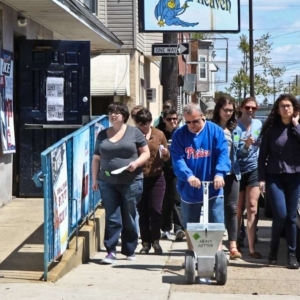 The HighWaterLine project was initiated and developed by Eve Mosher, and is currently led by Mosher and Heidi Quante. Mosher used data from publicly available research into flood hazard for New York City. 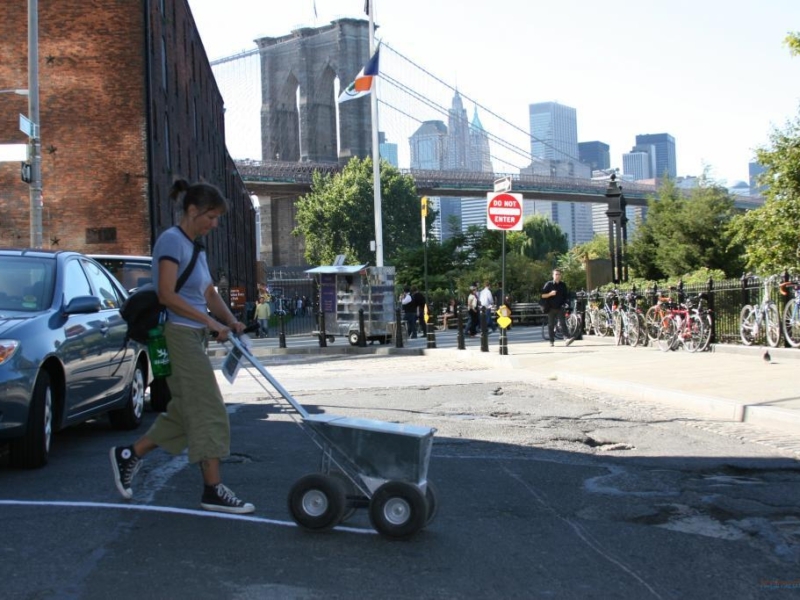 HighWaterLine | New York was produced with support from The Canary Project, an artist group created by artist duo Susannah Sayler and Edward Morris to create works which address ecological issues. In 2014, Mosher and Quante co-produced HighWaterLine | Miami in partnership with local organizer, Marta Viciedo. HighWaterLine | Bristol was presented by Invisible Dust, an organisation that brings together artists and scientists to explore issues relating to climate change, produced by Creative Catalysts, a non-profit that brings together various disciplines to raise awareness of social and environmental issues in creative ways and managed by local resident Isobel Tarr. In 2018 a more extensive guide to the project, a Creative Guide to Community Engagement, written by Eve Mosher and Quante was published online and is available freely to artists and communities. ...examining the idea of how to “reframe the global warming issue from a global one to a local one, with real, tangible actions.” The artist believes that projects like the High Water Line have the potential to not only raise public awareness, but also to serve as a catalyst for ongoing questioning in conjunction with shared resources and tools at the grassroots level. The HighWaterLine project allows communities to visually comprehend the consequences of climate change. It invites the audience to imagine future scenarios. By encouraging communities to recreate their own water line, globally, knowledge is transferred broadly and at a quicker rate than an individual artist could achieve. 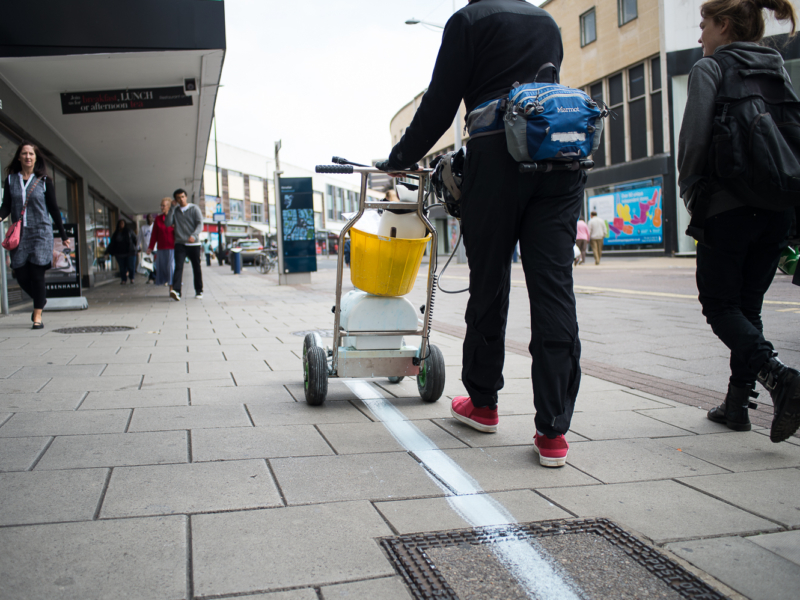 The slow and unusual process of drawing a line, encourages passers to engage in conversation. This creates educational opportunities; resiliency solutions are shared. By raising awareness of these sites, the project aims for communities and governments to realise their potential. I wanted to leave this visually interesting mark, to open up a space for conversation. The other part of the project was to try to prod some kind of conversation on a government level. Using public art as a method of raising awareness around the subject of climate change can provide audiences with different, more experiential and vivid ways of understanding and responding. A visual form especially in the environment can engage audiences better than data, as it encourages the audience to envisage the possible consequences. Positive transformation is unlikely to occur without community support. It is therefore imperative that communities are provided with further education on the topic through projects such as these. As more communities learn about the potential jeopardies triggered by global warming, positive transformation is more likely to ensue. By encouraging others to replicate their own similar versions of public art, the project message is spread further and faster. Information can be publicised at an exponential rate as more individuals and communities participate. Shared projects can achieve a grander scale than projects driven by an individual artist. The initial HighWaterLine in New York City was sponsored by the New York State Council on the Arts and New York Department of Cultural Affairs. 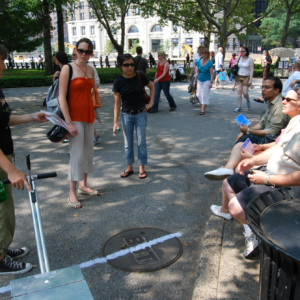 In 2008, Mosher devised the initiative, 'Insert_Here', a public art project which invites community contributions to possible environmental solutions. Banners were placed in urban locations to encourage passers to share these recommended solutions. 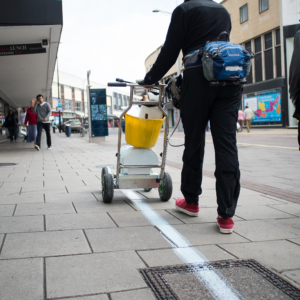 The project was designed to detach the artist from the activity, allowing communities, with an awareness of the area, to independently identify potential locations. The ‘Insert____Here’ project is an interactive project which provides an optimistic outlook on the topic of climate change, seeking solutions rather than simply providing disparaging projections. Residents are encouraged to participate in the activity as they provide an understanding of the location. They can suggest the best potential locations for remediation. Communities continue to raise funding for these spaces through petitions and crowdfunding platforms. The project allows audiences to envisage possibilities.